Fifteen-year old Harley Wood produced the performance of the week in Division Three of the Clacton and District League, taking a notable treble for Brotherhood J in their match with leaders Brotherhood E.
The fast-improving Wood recorded impressive wins over Rodney Betts, Tony Edmonds and Duncan Dunne, three of the Division's most seasoned and experienced players. Her closest contest was against Edmonds, the Brotherhood J starlet winning 6-11, 11-8, 10-12, 11-9, 11-4 to notch up her fourth hat-trick of the season. But the 'E' team took the match 7-3, Betts, Edmonds and Dunne winning two apiece, a result which keeps them clear at the top and needing an academic eight points from their remaining four matches to guarantee the title. In the battle for the runners-up spot, Nomads Pumas improved their position when they registered a comfortable 10-0 win over a Windsor Falcons' side which fielded a guest. Windsor Penguins lost ground, and now trail the Pumas by four points, despite beating Windsor Merlins 7-3. Alan Charman took three, Paul Dale two and Jackie Bunce one. Sharon Gowlett's two for the Merlins included an 11-4 in the fifth win against Dale, whilst Bradley Henshaw enjoyed a fine 11-6 in the fifth success against Bunce. But Nomads Leopards' outside chance of a second-place finish may have been scuppered after their 8-2 defeat at the hands of Walton D. Rivhu Khan made a rare appearance for Walton and took a comfortable treble but he was well supported by Lynette Sparks and Tony Sharman who both played well to take two apiece. Bob Jillins was the Leopards' points' scorer. Nomads Panthers, 10-0 winners over Nomads Lions, march relentlessly on at the top of Division One with John Hatley, Paul Hume and James Denyer all staying unbeaten. The only match which went the distance was Hatley's 14-12, 14-12, 12-14, 5-11, 11-5 win over Ethan Lloyd. Windsor Condors defeated Walton B 9-1 and are well-set for the runners-up spot. Greg Green and Ollie Rampton took trebles, and Mel Rampton two, whilst Paul Meikle got the Walton point, beating Rampton senior 11-3 in the fifth. Meikle nearly got another point, taking Green close before going down 11-8 in the decider. Walton A's 10-0 victory against Windsor Hawks kept alive their hopes of a third-place finish. Gary Young, Daniel Young and Gavin Price were their hat-trick men. It was the first whitewash defeat of the season for the Hawks and also the first time Windsor's Andy Vincent had failed to register a win. Windsor Eagles' Phil Smith and Mark Smith took trebles in their side's 8-2 success over Nomads Tigers who, with only three matches remaining, are running out of time to save their top-flight status. It was also 8-2 for Walton C against a two-player Lawford, now almost certain to be relegated. Paul Newbould and Graham Buxton were unbeaten for Walton but Lawford took two close matches, Charlie Denholm narrowly beating John Rankin 12-10, 10-12, 11-6, 14-16, 11-9, whilst Denholm and Ian Sherwood combined to beat Newbould and Rankin 11-8 in the decider to record Lawford's first doubles success of the season. With only three matches left to play, just six points separate the bottom three teams in Division Two. Nomads Jaguars moved off the foot of the table for the first time since October when they logged a welcome 6-4 victory over Windsor Buzzards, taking three of the four matches which went the distance. There were two wins each for Kevin Hume, Caroline Page and Harry Hawkes, Page beating Alan Rutledge 11-5, Hawkes beating Dan Malinowski by the same score, with Hume beating the unfortunate Malinowski 11-9 in the fifth. Ray Chillingworth stayed unbeaten for the Buzzards although it was a tight 11-8 in the fifth against Page. The Jaguars are now three points ahead of Brotherhood G who went down 8-2 to Brotherhood F. Shaun Beckham was the 'F' team's maximum man, his tightest win an 11-9 in the fifth success against Paul Metcalf. For the 'G' team there was a point each for Metcalf, who scraped past Lee Allen 12-10 in the decider, and for Mark Beckham who edged out Barry Allen 11-9 in the decider. Windsor Harriers are the third team fighting for survival and they are now just three points above the relegation zone following their 7-3 defeat the the hands of Windsor Kestrels. For the Kestrels, there was a treble for Graham Bunce and two for Bob Sawyer, whilst Debra Found had a narrow 14-12 in the fifth victory over Jenny Higgins. Elsewhere in the Division, Walton E beat Windsor Magpies 7-3, Gary Stallwood and Mark Ratcliffe both playing well to defeat Dave Martin on their way to their hat-tricks. Stallwood's 11-4, 16-18, 11-9, 9-11, 11-6 success against Martin was the closest contest of the evening. Finally, Brotherhood F, playing their second mach of the week, drew with Nomads Bobcats for a second time this season. Liam Harris was unbeaten for the Bobcats, with Barry Allen and Lee Allen winning a couple each for Brotherhood. 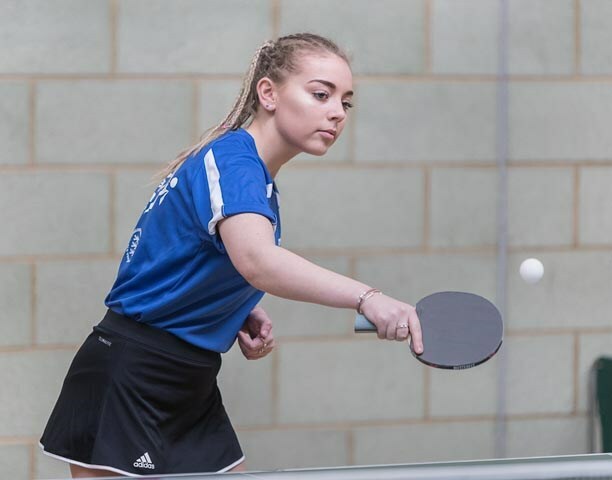 * There will be 59 players competing in this year's Closed Championships, sponsored for the 26th year by Paul Newbould Planning and Building Design Services. The Tournament takes place at the Coastal Academy Sports Hall on Saturday 13th and Sunday 14th April. Players will receive further details, including check-in times, by 7th April at the latest. * The Division Three Handicap Challenge final between Brotherhood E and Windsor Penguins will take place at the Brotherhood Hall on Tuesday 16th April. Windsor Hawks 0 Walton A 10. Brotherhood F 5 Nomads Bobcats 5. Brotherhood J 3 Brotherhood E 7.